Broque Monsieur is a Brock character in Mario & Luigi: Bowser's Inside Story and Mario & Luigi: Dream Team speaking English with a thick French accent and able to speak French itself. He also speaks Spanish. According to the Japanese official site, he is the Mushroom Kingdom's leading block collector; he is also a collector of block-shaped kittens called Blitties. Broque Monsieur owns a block-shaped dog named Broggy, and manages a store where Bowser can shop at to get healing items. His name is a pun on the name Brock (or the word block) and croque-monsieur, a French sandwich. The first encounter with Broque Monsieur, where he asks Bowser to assist him when a bridge broke, preventing him from leaving an island. An unknown period of time before Broque Monsieur's first appearance, he and Broque Madame dated, but have since separated. This is revealed when Mario and Luigi chat with her. He is first shown to be stuck on an island while Bowser walks past. He yells for Bowser's help, who only does it for a prize offered by Broque, the Vacuum Block. Broque tells Bowser to grab the rope and pull. At first, Bowser cannot pull the island any closer, but with the help of Mario and Luigi on the inside of his arms, he pulls the island back to the shore. Broque then fights Bowser to help him master the Vacuum Block technique. He is shown in a battle against Bowser. He explains the "vacuum" command to Bowser. He fights by using items he gets out of ? Blocks. Sometimes he uses a mushroom to recover 30 HP. However, he could go in the opposite direction of the mushroom and instead, it heals Bowser. Sometimes he uses a Mega Mushroom and makes himself giant. To counter Broque's colossal attack, the player has to make Bowser punch Broque just as he's about to ram into him. Doing this will make Broque's body be knocked far away from the battle field. While Broque's body is trying to get to his head, Bowser can punch it for extra coins. He loses a turn when he uses a coin. When being battled, he rotates his head to make himself look more fierce. During Giant Bowser's first battle in the DS version (in Dimble Wood), Broque is seen with Broggy, continuously saying "Big! Oui, so big!" Much later in the game, after Dark Bowser unleashes the dark wind on the Mushroom Kingdom, he is shown in a bubble with several Toads and the Koopa Paratroopa Trio. This was also not seen in the remake as well. Broque Monsieur rotating his head in both versions. Broque also runs his own shop where he sells items for Bowser. He also has some shops around the Mushroom Kingdom in the shape of a block. He owns two different shops. One for gear, mained by Broggy, and one for items such as Syrup Jars. Through the block-shaped shops called "Shop Blocks", Broque Monsieur can release "Negative Ions" to heal Bowser completely at the cost of 10 coins, much like Royal Mushroom Tea for Mario and Luigi. While Broque is friendly towards Bowser, he has a strong dislike of Mario because he considers Mario's habit of breaking blocks and lowering their "value" to be abhorrent. Because of this, Broque will refuse to sell items to the brothers and impolitely insist they leave his shop immediately and never come back (though he will immediately apologize for his rudeness). Additionally, the Mario Bros.' hammer is not strong enough to hit a Shop Block, thus eliminating the other method of shopping through Broque Monsieur. If the player gives him 15 Blitties, he will give Broggy to Bowser so he can use the special move Broggy Bonker. In Mario & Luigi: Bowser's Inside Story + Bowser Jr.'s Journey, he doesn't take damage from Bowser's punch at all despite having 80 HP and the battle will immediately end after Bowser masters the Vacuum technique and punches him once. The Mushroom he gets to restore his HP is now a Drumstick that recovers some of Bowser's HP. Broque Monsieur appears in Mario & Luigi: Dream Team. He welcomes Mario, Luigi, and Peach to Pi'illo Island and also provides enemies, which Toadsworth uses to further explain battling. Once the Grombas he unleashes are defeated, he states that this was all an act. Broque mentions, upon the bros' arrival, that they are familiar; however, he disregards this. His species, the Brocks, also appear in this game. Later in the game, he is also seen telling his co-workers that Mario and Luigi are crazy because of them hitting blocks from beneath, to which he turns around and sees Mario and Luigi listening, and runs out from embarrassment. In this game, he seems to have lightened up towards Mario and Luigi, and seeing them as strong allies; possibly starting to like them, but still finding them crazy for hitting blocks. A Dream World version of Broque Monsieur appears in Dreamy Pi'illo Castle to teach Mario how to fight in the Dream World, and also runs a couple of shops: one in this same Dream World and the other in Dreamy Neo Bowser Castle. Yoshi Theater features a poster in Mario & Luigi: Superstar Saga + Bowser's Minions, depicting a movie starring Broque Monsieur, Broque Madame, and Broggy. In Super Smash Bros. Ultimate, Broque Monsieur appears as a shield-type, primary spirit. His artwork is taken from Mario & Luigi: Bowser's Inside Story. In the Japanese version of the game, he speaks using "Engrish" words, phrases and sentences fairly often (for instance, in a scene he says "Oh my dog! What's happen!"). His trait of adding English sentences was carried over to the Korean version. In the English version, as well as the Spanish, Dutch, Italian, and Russian versions, he speaks with a French accent. In the European-French version, Broque Monsieur speaks broken French, saying sentences in an English context, using "le" instead of "la", and saying English words sometimes. 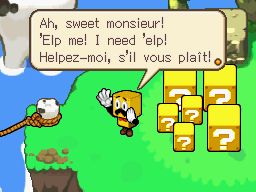 In the Canadian French version, Broque Monsieur speaks stereotypical European French (similar to his portrayal in other translations), due to differences between the French spoken in Quebec and France. In the German version, Broque Monsieur speaks correct German, without any accent, but in a noble and polite manner. "Your tongue, bit upon it!" "Such a fine block! We sing the song of block!" "Come, let us try zis out!" "ALLOOOOOOO! MON CUTE BROGGY! COME BACK TO MOI! I AM MISSING YOU!" Burirokku Official rōmaji is "Brirock." A portmanteau of English "Brick" and "Block." May also be derived from the name "Brock". French (NOA) Monsieur duBloc "duBloc" is a reference to many common French family names starting with "Du", like Dubois or Dupont. Italian Luc Blocque The French given name Luc (Luke) and blocque, a distortion of the French "bloc"
Beulrokeu In Korean, Blocks are called "블록" (Beulrok) and it is shown to be spelled similar to English. However, the official romanization is "Brirock", just like the Japanese romanization. This page was last edited on March 15, 2019, at 21:57.